The problem with the use of technology in education is not the technology itself, but rather the inappropriate use of it in relation to the educational objectives of a course. For example, if I am going to give a ground rounds talk, I may want to use PowerPoint slides. PowerPoint presentations can effectively convey and reinforce information if slides are used to highlight key points in an otherwise engaging presentation. However, if I place the entire text of the talk on the slide set, there is no point to its use. The PowerPoint slides no longer act as a visual aid for my presentation; the slides now become the presentation, distracting from what I'm saying. 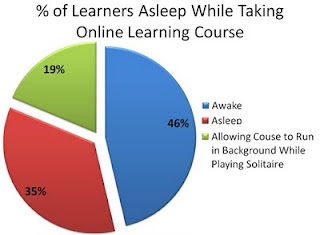 The same holds true for online learning media. Social interaction is a key component to learning. Just having text on a webpage adds nothing to traditional learning media. I am waiting for the day when someone treats me like an adult learner for these mandatory courses by giving me the option of opening a PDF with the entire text of the online course instead of tediously pressing the forward button until I fall asleep on the keyboard. Social media, including blogs, can play a role in this new frontier of medical education. I have learned more about palliative medicine from blogs like Pallimed than I have ever learned from a textbook. Just as in any small group classes, blogs generally start by picking a group of learners (in geripal’s case it is the geriatrics and palliative care community), producing some resource material that can serve as a stimulus for discussion (posts), and using at times facilitators for that discussion (the contributors). Learning objectives are created by the person creating the post or may arise out of discussions between participants commenting on the post. ***** Stay tuned for the next part of the series: The Dangers of Social Media In Medical Education. My two cents: PowerPoint has uses, but PowerPoint is in general overused. * Freedom rings in a broad range of places. * Will speed day of racial and religious harmony. * Day will include a sing-a-long. Great post Eric. In some ways, these on-line training courses can actually subvert the intended training purposes. An example of this is many of the on-line training courses we take at the VA. Some of these are useful. But each year, the list of mandatory on-line courses we take at the VA increases. Many are widely recognized to be of little value. But they are developed to resolve some problem or deficiency. The problem is that the these on-line courses really only serve the purpose of documenting that something has been done to address a problem, without any effort at assessing whether that "something" is of any value. The requirement to take the course substitutes for a serious attempt to address the underlying problem or issue. There is no requirement to examine whether the course serves the intended purpose. At its worst, mandatory education and training can be worse than useless because they can short circuit serious efforts to effectively address a problem. great comments Alex ... hilarious! Social media is widely used by these organizations. Learning through social media is definitely great.